We here at Meow.com are very concerned about pet overpopulation. Every year hundreds of thousands of unwanted “pets” starve to death, are killed in accidents, or euthanized (killed) in shelters that cannot find homes for them. 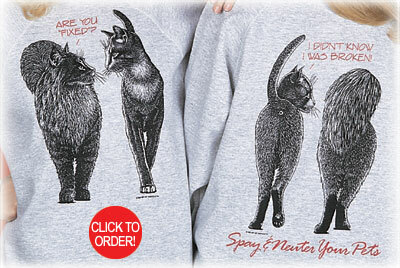 Meow.com supports spaying and neutering. We see it as one of the most loving things you can do for your pet and for the animal world in general. For more information regarding spay and neuter, click on the link below. 10% of all profits for our "Fixed Cats" shirts shown above go to organizations who promote spaying and neutering. 25% of the selling price of our HOBO Strays goes to No-Kill Shelters. Give a cat gift that helps cats and sends an important message to all! Saving Lives: Whether you adopt a cat or kitten from an animal shelter or from a rescue organization, you're saving lives. That's right: lives, as in more than one. Adoption saves more than just the life of the pet you adopt. If you adopt from an animal shelter, you're making room for a pet that might otherwise be euthanized, or you're allowing other pets at the shelter to be kept for a longer period of time, giving them a better shot at being adopted. If you take home a cat or kitten for adoption at a no-kill pet rescue organization, you're allowing that organization to rescue another pet from a public shelter, which, of course, saves the life of that pet plus the lives of other pets at that shelter by creating space so other animals can be kept longer. As you can see, adoption is truly a continuous cycle of saving lives! Know what you're getting (especially if you adopt an adult): If you're considering cat adoption, you probably have a good idea about what kind of personality you want your new adopted pet to have, right? For instance, maybe you need to adopt a cat who loves dogs, or one who likes to be around other cats. When you adopt an adult from a rescue or animal shelter instead of buying a kitten from a pet shop, what you see is what you get. Their personality is already developed, and you'll be able to spot the characteristics you're looking for much more easily than with a kitten bought at a store or from a breeder looking to make a buck. Rescue organizations, and many shelters that provide pet adoption counseling, are able to assess the personality of each pet for adoption, and carefully match you up with the right pet for your lifestyle. With a kitten, of course, there is a lot more guesswork involved. Want to adopt a cat who will instantly fit in with your family? That's easy when you adopt an adult from a kitten rescue organization or shelter! Cat & kitten adoption = an instant friend for life: Ask anybody who has adopted a cat or kitten, and they'll swear their bond with their rescued pal is as deep as they come. When you open your heart and your home to a pet who needs help, they really do show their appreciation for the rest of their life! Cats who have been uprooted from their homes, or have had difficult beginnings are likely to bond completely and deeply with their new human caretakers, whom they regard as heroes. Kitties who find themselves in the shelter or at a rescue because of a death or other tragedy in their former human family usually go through a mourning period. Once they are adopted, however, they usually want nothing more than to please their new hero---YOU! No matter what circumstances brought them to the rescue, most cats & kittens for adoption are exceptionally affectionate and attentive, and make wonderful companions. But first you have to adopt one! We promise, your new friend will think you're the cat's pajamas! Training, Socialization, & Health: Many cat & kitten rescue organizations use foster homes, where pets for adoption are socialized with other animals, and are trained to use a litter box before going to their new homes. As an added bonus, many rescue groups and shelters offer post-pet adoption workshops and training classes. When you adopt from these shelters, you'll have their continued support to help you through any rough spots you face during your pet's transition. In addition, when you adopt from a shelter or rescue group, you're adopting a healthier pet! Nearly all public shelters and rescues spay or neuter their pets for adoption and administer all necessary vaccines before they allow you to take your new pet home. They want to make sure your kitty has at least nine lives! A smarter option than buying from a pet store: No matter how "reputable" you think your local pet store is, they may be getting their animals from one of two sources: 1) a "backyard" breeder, or 2) a kitten mill. The majority of purebred animals in shelters or rescues are the product of "backyard" breeders who often sell kittens through the newspaper classified ads. These are people who think they can make some easy money by breeding their purebred cats. Many of these kittens are weaned from their mothers way too soon. Sometimes, backyard breeders turn into small-time kitten mills. What's a kitten mill? It's basically a factory farm for pets. The cats are kept in small cages and forced to breed at unhealthy rates. Female cats in kitten mills are made to have several litters per year, which is extremely dangerous and cruel. Each kitten mill produces several different breeds of cat, and pays little attention to the specific health and temperament issues related to each one. Genetic health testing is almost unheard of in kitten mills, and mass-producing animals for profit is the bottom line. In the worst kitten mills, unspeakable abuse and horrifying conditions are the norm. How can you stop kitten mills? There is only one way: take away their profits. NEVER BUY A KITTEN, OR A CAT FROM A PET STORE! Remember, adoption is the most humane option! Alley Cat Allies - Alley Cat Allies, is the national nonprofit clearinghouse for information on feral and stray cats. For more than a decade Alley Cat Allies has advocated Trap-Neuter-Return (TNR) - the most humane and effective method to reduce feral cat populations.